by Jessie Stolark (Environmental and Energy Study Institute) … While the bill is largely viewed as a status-quo farm bill, the bill importantly reauthorizes the Energy Title (IX) and contains some new programs and tweaks aimed at helping producers become more resilient to climate change. While overall the Energy Title receives less funding than the 2014 bill, the bill maintains significant mandatory funding for the Renewable Energy for America Program (REAP), an incredibly popular program that helps install renewable energy and energy efficiency technologies on farms, ranches and in rural businesses, and which is always oversubscribed. 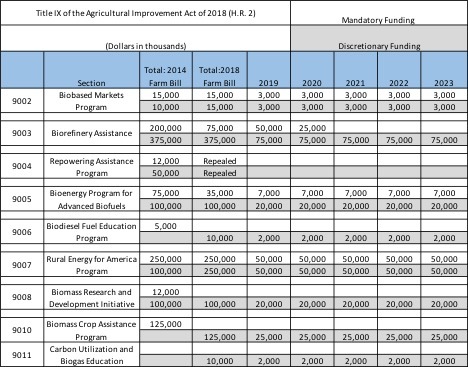 Unfortunately, both the Biomass Crop Assistance Program (BCAP) and the Biomass Research and Development Program (BRDI) received no mandatory funding. Both programs are crucial to diversifying and growing the bio-based economy, and should be expanded. There is also a new program, the Carbon Utilization and Biogas Education Program (Sec. 9011). This program will provide grants for education on the benefits of carbon sequestration. Carbon utilization research is now eligible for Biomass Research and Development funding.